A big baked potato with a dollop of sour cream and chives or laced with garlic and cheese is one of the sinful pleasures of dining. Roasting potatoes is one of the simplest tasks for the beginning cook to master. Several varieties of potato produce flaky, steaming baked potatoes, but the temperature at which they roast can affect the end result. Of the dozens of varieties of potatoes, the types best suited to roasting contain a high proportion of solids, according to the Idaho Potato Commission. 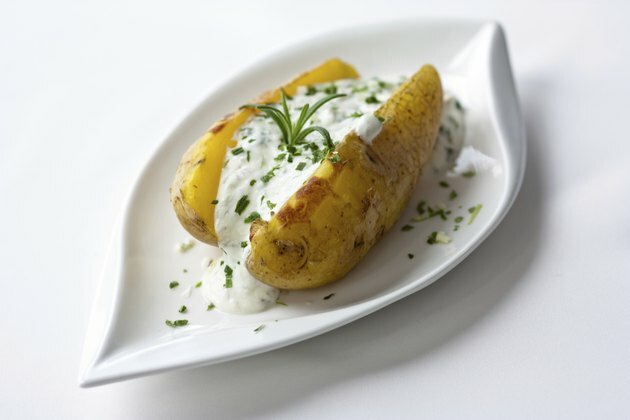 Large starch grains swell and create the light, flaky texture of a perfect baked potato. Russet, Andes, Yukon Gold and many other varieties meet these criteria. Potatoes with low density and smaller grains develop a waxy texture when cooked and are best boiled or used for French fries or potato chips because their starches hold together instead shattering into flakes. In order to shatter the starches of the baked potato into fluffy flakes, the internal temperature of the potato must reach 210 degrees Fahrenheit. To achieve this explosion of starch grains, an oven heated to 425 degrees Fahrenheit works best. The old “Good Housekeeping Cook Book,” published in 1942, suggests roasting washed potatoes at 450 degrees Fahrenheit for up to 60 minutes, but a preliminary Lund University study published in 2008 in “Molecular Nutrition and Food Research” found that potatoes roasted for lengthy periods at high temperatures may form acrylamide, a known carcinogen. The study proposed blanching and shorter roasting times for baked potatoes, suggesting that more recent cookbooks and published recipes -- which call for washing and oiling potato skins to hold in heat and roasting at 425 degrees Fahrenheit just until fork tender -- may be the safer alternative. When potatoes roast at a lower temperature, such as 325 to 350 degrees Fahrenheit with a roast, the interior reaches 210 degrees Fahrenheit more slowly, causing more drying of the potatoes’ “meat,” loss of mass and less-aggressive explosions of starch fibers. The result is an edible but waxier potato. Another practice, wrapping potatoes in foil, keeps moisture in. The foil results in soggy skin and interior and also requires longer cooking time. The slower rise in internal temperature results in gentler starch-grain expansion and a mealy rather than fluffy texture in the finished potato. If the cook wishes to roast potatoes at lower temperatures, two options may help avoid a mealy result. The first is to blanch the potatoes for 5 minutes before putting them in the oven, giving the cooking process a quick start. The second is to remove the insulating skin. Unfortunately, removing the skin also removes the greatest concentration of nutrients that gather next to the growing surfaces of the tuber. Both techniques, however, work at lower temperatures and shorten the time necessary to provide the heat necessary to burst the starch grains into a fluffy mass.